Paper by Mary Valante given at the Fourth Annual Appalachian Spring Conference in World History and Economics (2009). Viking raiders first appeared on the shores of western Europe in the 790s. For the year 793 the Anglo-Saxon Chronicles record, “…terrible portents appeared…and fiery dragons were seen flying in the air…. and the harrying of the heathen miserably destroyed God’s church at Lindisfarne.”, while the Annals of Ulster for 795 describe, “The burning of Rechru by the heathens, and Scí was overwhelmed and laid waste.” These early raids followed a distinct pattern – one or two ships, coastal raids , and hit-and-run tactics. But in the 830s and 840s, the patterns of raids changed suddenly and dramatically. The switch to larger raiding parties was swiftly followed by settlement, as in 841 Vikings first set up camp at Dublin. By the middle of the ninth century, it is clear that changes back in Scandinavia were having a direct impact on events in the British Isles, as shown by a takeover at Dublin in the 850s, and the arrival of the “Great Heathen Army” in Anglo-Saxon England in the 860s. Some scholars have argued that the early raids were a deliberate “softening up” of Europe, a deliberate prelude to land-grabbing. But this view assumes that raiders were displaced farmers, victims of climate change or population pressures. I would argue instead that the earliest raids were the work of minor chieftains, stealing goods to trade at the new market towns in Norway and Denmark. The large-scale raids from the 830s onwards were the result of the success of the early raids, which allowed the market towns to become well-established and successful. This in turn had provided funds for kings in Norway and Denmark to establish themselves more firmly, organize much larger raids, and then quickly to the deliberate founding or capture and settlement of new market towns in Ireland and Anglo-Saxon England. After the 850s, competition for power within Denmark and Norway, partially represented by vying for control of these same early towns, led once again to changes in Viking activities as seen especially in Ireland and England. The earliest raiders targeted monasteries, relatively wealthy and usually undefended sites. People and portable valuables were their targets, “Howth was plundered by the heathens, [and] they carried off a great number of women into captivity” and “The heathens plundered Bennchor at Airtiu(? ), and destroyed the oratory, and shook the relics of Comgall from their shrine.” The shrine, not the relics, held value the raiders could understand. Based on excavations of longships, a raiding crew would have consisted of about 30 men, led by their chieftain after planting and before harvest season. A series of Earth-shattering volcanic eruptions in Iceland during the Middle Ages may have spurred the people living there to turn away from their pagan gods and convert to Christianity, a new study finds. The discovery came about thanks to precise dating of the volcanic eruptions, which spewed lava about two generations before the Icelandic people changed religions. But why would volcanic eruptions turn people toward monotheism? The answer has to do with the “Vǫluspá,” a prominent medieval poem that predicted a fiery eruption would help lead to the downfall of the pagan gods, the researchers said. Historians have long known that the Vikings and Celts settled Iceland in about A.D. 874, but they were less certain about the date of the Eldgjá lava flood, the largest eruption to hit Iceland in the past few millennia. Knowing this date is crucial, because it can tell scientists whether the eruption — a colossal event that unleashed about 4.8 cubic miles (20 cubic kilometers) of lava onto Greenland — impacted the settlement there, the researchers said. To investigate, the researchers examined ice core records. Their results showed that the eruption took place less than 100 years after people settled the island. The volcano began gushing lava in the spring of A.D. 939 and lasted, at least episodically, until the autumn of 940, the researchers said. The finding matches medieval chronicles from Ireland, Germany and Italy that noted the spread of a haze in 939. Moreover, the tree-ring data revealed that in A.D. 940, the Northern Hemisphere had one of its coldest summers in the previous 1,500 years — a cold shift consistent with the release of large amounts of volcanic sulfur into the atmosphere, the researchers said. “In 940, summer cooling was most pronounced in Central Europe, Scandinavia, the Canadian Rockies, Alaska and Central Asia, with summer average temperatures 2 degrees Celsius [3.6 degrees Fahrenheit] lower,” co-researcher Markus Stoffel, a professor in the Department of Earth Sciences at the University of Geneva in Switzerland, said in the statement. Suffering followed, with hard winters and drought in the spring and summer. Locusts invaded, and livestock died. “Famine did not set in everywhere, but in the early 940s, we read of starvation and vast mortality in parts of Germany, Iraq and China,” said study co-researcher Tim Newfield, an environmental historian at Georgetown University, in Washington, D.C. However, no texts from that period survive from Iceland, the volcano’s homeland. A mere two generations after the Eldgjá eruption, in about A.D. 1000, the people of Iceland formally converted to Christianity. And it likely had to do with the “Vǫluspá,” the researchers said. The “Vǫluspá” was written after the eruptions, in about A.D. 961. It describes how an eruption and meteorological events would mark the end of the pagan gods, who would be replaced by one, singular god, the researchers said. Part of the poem explains how “the sun starts to turn black, land sinks into sea; the bright stars scatter from the sky … flame flies high against heaven itself,” according to a translation. Considering Eldgjá’s eruptions date to before the poem was written, Icelanders who experienced the fiery spectacle likely looked back at the events and wrote the poem, “with the purpose of stimulating Iceland’s Christianization over the latter half of the 10th century,” the researchers wrote in the study, published online in the journal Climate Change. Slátur is one of the most popular traditional Icelandic dishes, other traditional delicacies such as fermented shark and sour rams’ testicles are less popular and generally only eaten during the heathen midwinter festival Þorrablót. And understandably so! Slátur was a common and popular dish among Icelanders well into the 20th century but by the end of the century, slátur had lost the popularity contest to fast food and a more modern cuisine. There are, however, still families that meet religiously over a weekend in autumn to make slátur, not least because it is a nutritious, tasty and very cheap meal. The word, slátur, means slaughter and is a term used for blóðmör, lifrarpylsa and scorched sheep‘s head. In former times the term was used for everything and anything that was considered edible from the sheep. According the book Íslensk matarhefð (Traditional Icelandic Cuisine) written by ethnologist Hallgerður Gísladóttir, every autumn the men on the farm performed the bloody task that was slaughtering the sheep that had spent the summer of freely roaming the mountains. Women and children then prepared various foods from the innards and blood. Finally the produce was smoked or preserved in salt or whey. Sheep’s blood was amongst other things used to make blood pudding, porridge and bread. Blood porridge was more common amongst Southerners while people in the northern regions of the country preferred blood pudding (hot pudding made from milk, butter, flour and sheep’s blood and served with sugar, cinnamon and cream). The two most popular dishes made from sheep’s innards are, however, blóðmör and lifrarpylsa. Blóðmör is similar to Irish black pudding and is made from sheep‘s blood, flour and suet. Lifrarpylsa on the other hand resembles Scottish haggis and is made from the innards of sheep mixed with flour and suet and stuffed into little pouches that have been cut from the sheep’s stomach and sewn together. Of the two, the latter is more popular and usually eaten warm with mashed potatoes and turnips. Other common traditional dishes have long disappeared – among those are salted cow’s udder, mashed sheep’s brain and brain dumplings boiled in the broth from lifrarpylsa. Sheep’s stomachs were solely used as pouches for lifrarpylsa and blóðmör in Iceland, however in Denmark and Norway they were used to make a soup called Kallun suppe. When blóðmör was made the blood was generally mixed with Icelandic moss and different herbs and plants, some would even use chopped kale. Nowadays the blood is mixed in with flour. The mixture was then stuffed into a pouch made from sheep‘s stomach. When full, it was either pinned shut with a wooden needle called „sneis“ or sewn shut (the idiomatic Icelandic term „sneisafullur“, or full to the brim, derives from this). Blood pudding was generally fried with butter and sugar and served with potatoes or turnips. The first account of lyfrarpylsa, or haggis, dates back to the 18th century. Back then little or no flour was added to the mixture and the produce was generally pickled in whey. The lifrarpylsa was considered to be somewhat of an aphrodisiac and sometimes called „galsapylsa“, which literally translates to the „lively sausage“. It was said that men turned quite frisky soon after eating a lifrarpylsa. Some trivia: The heathen month of gore, or gormánuður, was the first month of winter and began on a Saturday, usually between the 21st and 27th of October. The name comes from the innards of sheep and cattle that lay scattered around the farmhouses during slaughter season. In the year of the Lord 1347, the Black Death arrived in Europe. Introduced by merchants coming from Asia, the plague, caused by the bacterium Yersinia pestis, spread quickly. Following trading routes, in just six years this incurable disease killed 25 million people, one-third of the population on the continent. Entire villages were wiped out, some cities lost 80% of their citizens. The plague was followed by famine. Thomas Basinus (1412-1491), bishop of Èvreux and later historian, notes that ‘many peasants fled or died so that many fields remained uncultivated or there was nobody left to care.’ In the cities, overpopulation and poor hygiene helped to spread the plague, rivers were used to dispose of the many corpses, contaminating the water. Riots of desperate people were common, like in 1323 in Flanders and in 1358 in France. Many believed, as one witness testified, that the end of the world had arrived. The Triumph of Death is a painting by Pieter Bruegel the Elder, painted c. 1562 it was inspired by the waves of the Black Death plaguing the 14th century. The dramatically reduced population had, however, a surprisingly beneficial effect on the environment. The pollution of the air dropped to a historic low. Analyzing a 236 feet long ice core recovered from a glacier in the Swiss-Italian Alps, a team of scientists from Harvard University was able to reconstruct the concentration of lead in the air over Europe for the last 2,000 years. The research with the title ‘Next-generation ice core technology reveals true minimum natural levels of lead (Pb) in the atmosphere: Insights from the Black Death,’ was published in the open access journal GeoHealth. Atmospheric circulation transported the lead from the lowlands into the Alps, where it was washed out from the atmosphere by rain and snow. The snow, accumulating mostly during winter, partially melts and changes over the summer into ice, forming single layers, as found in a glacier. By analyzing the concentration of elements in the single layers, it is possible to create an annual record of the atmospheric deposition. One significant spike can be found around 1349-1353 when the measured concentration of lead dropped far below the average value of 10^2 nanogram of lead per liter air. Even today, after the introduction of unleaded fuel in the 1980s, the concentration of lead in the air is still 10 times higher as in 1350. In medieval times, lead was used for roofing of large buildings such as cathedrals, water pipes, but especially for dishes and glazed pottery valued by the rich. The most important lead ore is galena. As galena also contains silver, it was widely mined (silver, lead, and copper were the most important metals in medieval Europa). The most productive mines were found on the British island, South Italy, the Harz mountains with Freiberg in Saxony and Kutna Hora in Bohemia. We know of contemporary records of the silver medieval monarchs received as royalties, that the mines of Freiberg and Kutna Hora alone provided 20 tons of silver and 100 tons of lead per year. To get this amount, it was necessary to mine and process an almost 2,000 times larger quantity of rocks and ore. The Black Death impacted mining in two ways. The miners and workers died in great number, and many mines were abandoned. As the population died, including the rich people, the demand for lead also dropped. The Black Death was so deadly, mining for lead virtually stopped and no lead dust, coming from both mining as smelting, was dispersed into the environment. As the atmosphere became cleaner, the concentration of lead deposited in the glaciers of the Alps dropped. Entrance to a medieval mine in the Alps, dated around 1530. The Black Death had a disastrous impact and yet helped to create modern Europe. Plagued previously by overpopulation and poverty, Europe could reinvent itself after the Black Death made the old political system obsolete. Many peasants at the time were virtually slaves, owned by the rich landlords. As the landlords were gone, many people were free to choose where and when to settle. The surviving landlords, in desperate need of somebody to take care of their properties, agreed to lower the taxes and more privileges were granted to farmers. Wages everywhere increased, as healthy workers were rare, and the land became cheaper. Many previously poor people managed to achieve some wealth. Authorities even tried to forbid the use of fur in clothing, a privilege reserved only to the aristocracy in former times, but now common. Political and social independence was now possible and a new class rose from the ashes of the old society — the free citizen. A new human being for a new epoch, as the Renaissance was later seen by historians. However, even after 1353, the Black Death didn’t completely disappear. Almost once in a decade, a smaller outbreak was reported, but improved hygiene in the cities, quarantine procedures, and an acquired genetic immunity of the survivors reduced the risk of infection significantly. This societal development can also be seen in the studied ice core. Just some years after the plague of 1347-1353, the concentration of lead significantly increased, approaching values seen before the Black Death. The European mining industry experienced a boom in the 15th and 16th century, testified also by many active mines found now also in the Alps. Only recently the concentration of lead started to drop again, in response to efforts to ban this toxic element from daily use and improved environmental regulations. However, it is still an important metal, mostly used for batteries in the automobile industry. On the grassy slope of a fjord near the southernmost tip of Greenland stand the ruins of a church built by Viking settlers more than a century before Columbus sailed to the Americas. The thick granite-block walls remain intact, as do the 20-foot-high gables. The wooden roof, rafters and doors collapsed and rotted away long ago. Now sheep come and go at will, munching wild thyme where devout Norse Christian converts once knelt in prayer. The Vikings called this fjord Hvalsey, which means “Whale Island” in Old Norse. It was here that Sigrid Bjornsdottir wed Thorstein Olafsson on Sunday, September 16, 1408. The couple had been sailing from Norway to Iceland when they were blown off course; they ended up settling in Greenland, which by then had been a Viking colony for some 400 years. Their marriage was mentioned in three letters written between 1409 and 1424, and was then recorded for posterity by medieval Icelandic scribes. Another record from the period noted that one person had been burned at the stake at Hvalsey for witchcraft. But the documents are most remarkable—and baffling—for what they don’t contain: any hint of hardship or imminent catastrophe for the Viking settlers in Greenland, who’d been living at the very edge of the known world ever since a renegade Icelander named Erik the Red arrived in a fleet of 14 longships in 985. For those letters were the last anyone ever heard from the Norse Greenlanders. Europeans didn’t return to Greenland until the early 18th century. When they did, they found the ruins of the Viking settlements but no trace of the inhabitants. The fate of Greenland’s Vikings—who never numbered more than 2,500—has intrigued and confounded generations of archaeologists. So what happened to them? Accordingly, the Vikings were not just dumb, they also had dumb luck: They discovered Greenland during a time known as the Medieval Warm Period, which lasted from about 900 to 1300. Sea ice decreased during those centuries, so sailing from Scandinavia to Greenland became less hazardous. Longer growing seasons made it feasible to graze cattle, sheep and goats in the meadows along sheltered fjords on Greenland’s southwest coast. In short, the Vikings simply transplanted their medieval European lifestyle to an uninhabited new land, theirs for the taking. But eventually, the conventional narrative continues, they had problems. Overgrazing led to soil erosion. A lack of wood—Greenland has very few trees, mostly scrubby birch and willow in the southernmost fjords—prevented them from building new ships or repairing old ones. But the greatest challenge—and the coup de grâce—came when the climate began to cool, triggered by an event on the far side of the world. Amid that calamity, so the story goes, Greenland’s Vikings—numbering 5,000 at their peak—never gave up their old ways. They failed to learn from the Inuit, who arrived in northern Greenland a century or two after the Vikings landed in the south. They kept their livestock, and when their animals starved, so did they. The more flexible Inuit, with a culture focused on hunting marine mammals, thrived. But over the last decade a radically different picture of Viking life in Greenland has started to emerge from the remains of the old settlements, and it has received scant coverage outside of academia. “It’s a good thing they can’t make you give your PhD back once you’ve got it,” McGovern jokes. He and the small community of scholars who study the Norse experience in Greenland no longer believe that the Vikings were ever so numerous, or heedlessly despoiled their new home, or failed to adapt when confronted with challenges that threatened them with annihilation. “It’s a very different story from my dissertation,” says McGovern. “It’s scarier. You can do a lot of things right—you can be highly adaptive; you can be very flexible; you can be resilient—and you go extinct anyway.” And according to other archaeologists, the plot thickens even more: It may be that Greenland’s Vikings didn’t vanish, at least not all of them. Lush grass now covers most of what was once the most important Viking settlement in Greenland. Gardar, as the Norse called it, was the official residence of their bishop. A few foundation stones are all that remain of Gardar’s cathedral, the pride of Norse Greenland, with stained glass and a heavy bronze bell. Far more impressive now are the nearby ruins of an enormous barn. Vikings from Sweden to Greenland measured their status by the cattle they owned, and the Greenlanders spared no effort to protect their livestock. The barn’s Stonehenge-like partition and the thick turf and stone walls that sheltered prized animals during brutal winters have endured longer than Gardar’s most sacred architecture. Gardar’s ruins occupy a small fenced-in field abutting the backyards of Igaliku, an Inuit sheep-farming community of about 30 brightly painted wooden houses overlooking a fjord backed by 5,000-foot-high snowcapped mountains. No roads run between towns in Greenland—planes and boats are the only options for traversing a coastline corrugated by innumerable fjords and glacial tongues. On an uncommonly warm and bright August afternoon, I caught a boat from Igaliku with a Slovenian photographer named Ciril Jazbec and rode a few miles southwest on Aniaaq fjord, a region Erik the Red must have known well. Late in the afternoon, with the arctic summer sun still high in the sky, we got off at a rocky beach where an Inuit farmer named Magnus Hansen was waiting for us in his pickup truck. After we loaded the truck with our backpacks and essential supplies requested by the archaeologists—a case of beer, two bottles of Scotch, a carton of menthol cigarettes and some tins of snuff—Hansen drove us to our destination: a Viking homestead being excavated by Konrad Smiarowski, one of McGovern’s doctoral students. The homestead lies at the end of a hilly dirt road a few miles inland on Hansen’s farm. It’s no accident that most modern Inuit farms in Greenland are found near Viking sites: On our trip down the fjord, we were told that every local farmer knows the Norse chose the best locations for their homesteads. The Vikings established two outposts in Greenland: one along the fjords of the southwest coast, known historically as the Eastern Settlement, where Gardar is located, and a smaller colony about 240 miles north, called the Western Settlement. Nearly every summer for the last several years, Smiarowski has returned to various sites in the Eastern Settlement to understand how the Vikings managed to live here for so many centuries, and what happened to them in the end. He and his team of seven students have spent several weeks digging into a midden—a trash heap—just below the homestead’s tumbled ruins. On a cold, damp morning, Cameron Turley, a PhD candidate at the City University of New York, stands in the ankle-deep water of a drainage ditch. He’ll spend most of the day here, a heavy hose draped over his shoulder, rinsing mud from artifacts collected in a wood-framed sieve held by Michalina Kardynal, an undergraduate from Cardinal Stefan Wyszynski University in Warsaw. This morning they’ve found a delicate wooden comb, its teeth intact. They’re also finding seal bones. Lots of them. A seal-based diet would have been a drastic shift from beef-and-dairy-centric Scandinavian fare. But a study of human skeletal remains from both the Eastern and Western settlements showed that the Vikings quickly adopted a new diet. Over time, the food we eat leaves a chemical stamp on our bones—marine-based diets mark us with different ratios of certain chemical elements than terrestrial foods do. Five years ago, researchers based in Scandinavia and Scotland analyzed the skeletons of 118 individuals from the earliest periods of settlement to the latest. The results perfectly complement Smiarow­ski’s fieldwork: Over time, people ate an increasingly marine diet, he says. It’s raining heavily now, and we’re huddled beneath a blue tarp next to the midden, sipping coffee and ingesting some terrestrial chemical elements in the form of cookies. In the earliest days of the settlements, Smiarowski says, the study found that marine animals made up 30 to 40 percent of the Norse diet. The percentage steadily climbed, until, by the end of the settlement period, 80 percent of the Norse diet came from the sea. Beef eventually became a luxury, most likely because the volcano-induced climate change made it vastly more difficult to raise cattle in Greenland. Judging from the bones Smiarowski has uncovered, most of the seafood consisted of seals—few fish bones have been found. Yet it appears the Norse were careful: They limited their hunting of the local harbor seal, Phoca vitulina, a species that raises its young on beaches, making it easy prey. (The harbor seal is critically endangered in Greenland today due to overhunting.) “They could have wiped them out, and they didn’t,” Smiarowski says. Instead, they pursued the more abundant—and more difficult to catch—harp seal, Phoca groenlandica, which migrates up the west coast of Greenland every spring on the way from Canada. Those hunts, he says, must have been well-organized communal affairs, with the meat distributed to the entire settlement—seal bones have been found at homestead sites even far inland. The regular arrival of the seals in the spring, just when the Vikings’ winter stores of cheese and meat were running low, would have been keenly anticipated. “People came from different farms; some provided labor, some provided boats,” Smiarowski says, speculating. “Maybe there were several centers organizing things along the coast of the Eastern Settlement. Then the catch was divided among the farms, I would assume according to how much each farm contributed to the hunt.” The annual spring seal hunt might have resembled communal whale hunts practiced to this day by the Faroe Islanders, who are the descendants of Vikings. The Norse harnessed their organizational energy for an even more important task: annual walrus hunts. Smiarowski, McGovern and other archaeologists now suspect that the Vikings first traveled to Greenland not in search of new land to farm—a motive mentioned in some of the old sagas—but to acquire walrus-tusk ivory, one of medieval Europe’s most valuable trade items. Who, they ask, would risk crossing hundreds of miles of arctic seas just to farm in conditions far worse than those at home? As a low-bulk, high-value item, ivory would have been an irresistible lure for seafaring traders. Smiarowski and other archaeologists have unearthed ivory fragments at nearly every site they’ve studied. It seems the Eastern and Western settlements may have pooled their resources in an annual walrus hunt, sending out parties of young men every summer. “An individual farm couldn’t do it,” he says. “You would need a really good boat and a crew. And you need to get there. It’s far away.” Written records from the period mention sailing times of 27 days to the hunting grounds from the Eastern Settlement and 15 days from the Western Settlement. How profitable was the ivory trade? Every six years, the Norse in Greenland and Iceland paid a tithe to the Norwegian king. A document from 1327, recording the shipment of a single boatload of tusks to Bergen, Norway, shows that that boatload, with tusks from 260 walruses, was worth more than all the woolen cloth sent to the king by nearly 4,000 Icelandic farms for one six-year period. Archaeologists once assumed that the Norse in Greenland were primarily farmers who did some hunting on the side. Now it seems clear that the reverse was true. They were ivory hunters first and foremost, their farms only a means to an end. Why else would ivory fragments be so prevalent among the excavated sites? And why else would the Vikings send so many able-bodied men on hunting expeditions to the far north at the height of the farming season? “There was a huge potential for ivory export,” says Smiarowski, “and they set up farms to support that.” Ivory drew them to Greenland, ivory kept them there, and their attachment to that toothy trove may be what eventually doomed them. And push it they did. The growing season was short, and the land vulnerable to overgrazing. Ian Simpson has spent many seasons in Greenland studying soil layers where the Vikings farmed. The strata, he says, clearly show the impact of their arrival: The earliest layers are thinner, with less organic material, but within a generation or two the layers stabilized and the organic matter built up as the Norse farmwomen manured and improved their fields while the men were out hunting. “You can interpret that as being a sign of adaptation, of them getting used to the landscape and being able to read it a little better,” Simpson says. Then, in the 13th century, after three centuries, their world changed profoundly. First, the climate cooled because of the volcanic eruption in Indonesia. Sea ice increased, and so did ocean storms—ice cores from that period contain more salt from oceanic winds that blew over the ice sheet. Second, the market for walrus ivory collapsed, partly because Portugal and other countries started to open trade routes into sub-Saharan Africa, which brought elephant ivory to the European market. “The fashion for ivory began to wane,” says Dugmore, “and there was also the competition with elephant ivory, which was much better quality.” And finally, the Black Death devastated Europe. There is no evidence that the plague ever reached Greenland, but half the population of Norway—which was Greenland’s lifeline to the civilized world—perished. The Norse probably could have survived any one of those calamities separately. After all, they remained in Greenland for at least a century after the climate changed, so the onset of colder conditions alone wasn’t enough to undo them. Moreover, they were still building new churches—like the one at Hvalsey—in the 14th century. But all three blows must have left them reeling. With nothing to exchange for European goods—and with fewer Europeans left—their way of life would have been impossible to maintain. 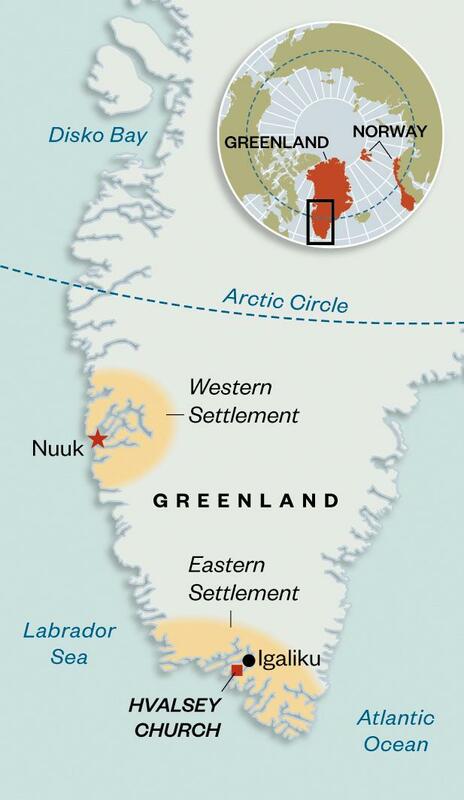 The Greenland Vikings were essentially victims of globalization and a pandemic. So what was the endgame like in Greenland? Although archaeologists now agree that the Norse did about as well as any society could in confronting existential threats, they remain divided over how the Vikings’ last days played out. Some believe that the Norse, faced with the triple threat of economic collapse, pandemic and climate change, simply packed up and left. Others say the Norse, despite their adaptive ingenuity, met a far grimmer fate. Niels Lynnerup, a forensic anthropologist at the University of Copenhagen who has studied Viking burial sites in Greenland, isn’t so sure. “I think in Greenland it happened very gradually and undramatically,” he tells me as we sit in his office, beneath a poster of the Belgian cartoon character Tintin. “Maybe it’s the usual human story. People move to where there are resources. And they move away when something doesn’t work for them.” As for the silence of the historical record, he says, a gradual departure might not have attracted much attention. We do know that at least two people made it out of Greenland alive: Sigrid Bjornsdottir and Thorstein Olafsson, the couple who married at Hvalsey’s church. They eventually settled in Iceland, and in 1424, for reasons lost to history, they needed to provide letters and witnesses proving that they had been married in Greenland. Whether they were among a lucky few survivors or part of a larger immigrant community may remain unknown. But there’s a chance that Greenland’s Vikings never vanished, that their descendants are with us still. Archaeologists still wonder today. No chapter of Arctic history is more mysterious than the disappearance of these Norse settlements sometime in the 15th century. Theories for the colony’s failure have included everything from sinister Basque pirates to the Black Plague. But historians have usually pinned most responsibility on the Norse themselves, arguing that they failed to adapt to a changing climate. The Norse settled Greenland from Iceland during a warm period around 1000 C.E. But even as a chilly era called the Little Ice Age set in, the story goes, they clung to raising livestock and church-building while squandering natural resources like soil and timber. Meanwhile, the seal-hunting, whale-eating Inuit survived in the very same environment. Over the last decade, however, new excavations across the North Atlantic have forced archaeologists to revise some of these long-held views. An international research collective called the North Atlantic Biocultural Organisation (NABO) has accumulated precise new data on ancient settlement patterns, diet, and landscape. The findings suggest that the Greenland Norse focused less on livestock and more on trade, especially in walrus ivory, and that for food they relied more on the sea than on their pastures. There’s no doubt that climate stressed the colony, but the emerging narrative is not of an agricultural society short on food, but a hunting society short on labor and susceptible to catastrophes at sea and social unrest. Ironically, just as this new picture is emerging, climate change once again threatens Norse settlements—or what’s left of them. Organic artifacts like clothing and animal bones, preserved for centuries in the deep freeze of the permafrost, are decaying rapidly as rising temperatures thaw the soil. “It’s horrifying. Just at the time we can do something with all this data, it is disappearing under our feet,” Holm says. In 1976, a bushy-bearded Thomas McGovern, then 26, arrived for the first time on the grassy shore of a fjord in southern Greenland, eager to begin work on his Ph.D. in archaeology. The basic Norse timeline had already been established. In the ninth century, the advances in seafaring technology that enabled Scandinavian Vikings to raid northern and central Europe also opened the way for the Norse, as they came to be known in their later, peaceful incarnations, to journey west to Iceland. If the unreliable Icelandic Sagas, written centuries later, are to be believed, an enterprising Icelander named Erik the Red led several ships to Greenland around 985 C.E. The Norse eventually established two settlements, with hundreds of farms and more than 3000 settlers at their peak. But by 1400, the settlement on the island’s western coast had been abandoned, according to radiocarbon dates, and by 1450 the inhabitants in the Eastern Settlement on the island’s southern tip were gone as well. Bone samples suggest that even small farms kept a cow or two, a sign of status back in Norway, and written records mention dairy products including cheese, milk, and a yogurt called skyr as essential parts of the diet. “There were no activities more central to Norse identity than farming,” archaeologist William Fitzhugh of the Smithsonian Institution’s National Museum of Natural History (NMNH) in Washington, D.C., wrote in 2000. Geographer Jared Diamond of the University of California, Los Angeles, popularized this view in his 2005 bestseller, Collapse. The Norse “damaged their environment” as they had done in Iceland, Diamond asserted, based on analyses of dust that suggested erosion caused by felling trees, agriculture, and turf cutting. While foolishly building churches with costly bronze bells, Diamond said, Greenland’s Norse “refused to learn” Arctic hunting techniques from the Inuit, who hunted seals and fish year-round. He noted grisly evidence of calamity at a few sites in the Western Settlement: bones of pet dogs with cut marks on them, suggesting hunger; and the remains of insects that feast on corpses, suggesting too few survivors to bury their loved ones. “Every one of [the Norse] ended up dead,” Diamond said in 2008. This narrative held sway for years. Yet McGovern and others had found hints back in the 1980s that the Norse didn’t entirely ignore Greenland’s unique ecology. Even Diamond had noted that bones of seals comprised 60% to 80% of the bones from trash heaps, called middens, found at small Norse farms. (He believed, though, that only the poorer settlers ate seal meat.) Written sources reported that the Norse routinely rowed up to 1500 kilometers to walrus migratory grounds near Disko Bay in western Greenland. They returned with countless walrus snouts, whose ivory tusks they removed and prepared for trade with Europe. The Norse paid tithe to the Norwegian king and to the Catholic Church in ivory, and traded it with European merchants for supplies like iron, boat parts, and wood. But McGovern dismissed the walrus hunt as “a curious adjunct,” he recalls, echoing the scholarly consensus that farming was central. Three decades later here at Tasilikulooq, a modern Inuit farm of green pastures flanked by lakes, a couple of McGovern’s students and others are busy exploring the remains of a medium-sized farm that once housed sheep, goats, horses, and a few cows. Two graduate students in rubber overalls hose 700-yearold soil off unidentified excavated objects near a midden downhill from a collapsed house. A brown button the size of a nickel emerges on the metal sieve. “They found one more of those buttons,” says archaeologist Brita Hope of the University Museum of Bergen in Norway, smiling, when word makes it back to the farmhouse the nine-member team uses as a headquarters for the month-long dig. “We could make a coat,” a student jokes. But the function of the button matters a lot less than what it’s made of: walrus tooth. Several walrus face bones have also turned up at the farm, suggesting that the inhabitants hunted in the communal Disko Bay expedition, says excavation leader Konrad Smiarowski of the City University of New York in New York City. These finds and others point to ivory—a product of Greenland’s environment—as a linchpin of the Norse economy. One NABO dig in Reykjavik, for example, yielded a tusk, radiocarbon dated to about 900 C.E., which had been expertly removed from its skull, presumably with a metal tool. The find suggests that the early Icelandic Norse were “experienced in handling walrus ivory,” NABO members wrote in a 2015 paper; it follows that the Greenlanders were, too. Although historians long assumed that the Norse settled Iceland and Greenland in search of new farmland, some researchers have recently suggested that the hunt for ivory instead drove the settlement of both islands. Walrus in Iceland were steadily extirpated after the Norse arrived there, likely hunted out by the settlers. The high value that medieval Europe placed on walrus ivory would have provided plenty of incentive to pursue it in Greenland. Craftsmen used ivory in luxury ornaments and apparel, and in objects like the famous Lewis chess set, discovered in Scotland in 1831. In 1327, an 802-kilogram parcel of Greenland tusks was worth a small fortune—the equivalent of roughly 780 cows or 60 tons of dried fish, according to tithing records analyzed in 2010 by University of Oslo archaeologist Christian Keller. “The Norse had found a cornucopia in the North Atlantic, a marine ecosystem just teeming with walruses and other animals,” says historian Holm. They exploited it not just for ivory, but also for food, Smiarowski says as he huddles in a dimly lit side room here to review recent finds. One bag contains bones collected from a layer dating to the 1350s. A long, thin, cow bone had been split open, probably to eat the marrow. But most of the bones are marine: scraps of whale bone, jaw and skull fragments of harp seals, a bit of inner ear of a hooded seal. These two species of seal migrate north along Greenland shores in the spring, and Smiarowski thinks the Norse likely caught them with boats and nets or clubs. In 2012, NABO researchers clinched the case that the Greenlanders ate a marine diet by analyzing human bones in Norse graveyards. Animals that live in the sea have ratios of carbon and nitrogen isotopes that differ from those found in terrestrial animals, and this isotopic signature is passed on to the people who eat them. The Norse bones show that as the settlement developed from the 11th to the 15th century, their diet contained ever more marine protein. Far from clinging to livestock as temperatures fell, the Norse instead managed a successful subsistence system with “flexibility and capacity to adapt,” wrote the author of the 2012 paper, Jette Arneborg from the National Museum of Denmark in Copenhagen. Nor were the Norse incompetent farmers, as Diamond and others have suggested. Soil geographer Ian Simpson of the University of Stirling in the United Kingdom says previous studies overestimated the Norse contribution to erosion in Greenland. New pollen and soil data show that the Norse allowed fields and what little forest existed to recover after tilling and turf cutting. And in analyses of soil and lake sediment cores, researchers have found chemical and paleoecological clues indicating that Norse farmers skillfully maintained pastures with manure fertilizer and irrigation ditches. It was a sustainable lifestyle for hundreds of years. But in the 13th century, economics and climate began to conspire against the Norse. After 1250, a cooling climate posed multiple threats to a marine-oriented society reliant on seal and walrus. (Global average temperature fell by about a degree during the Little Ice Age, although scientists have struggled to quantify local cooling.) Even before the big chill set in, The King’s Mirror describes ships lost and men who perished in ice. Historians and climatologists agree that as the cold spell continued, ice would have clogged the seas farther south and for longer each year, disrupting voyages. And concentrations of salt particles in glacier cores indicate that seas became stormier in the 15th century. Norsemen hunting migratory seals or walrus on the high seas would have been at increasing risk. The nomadic Inuit, by contrast, hunted seal native to the fjords, and rarely embarked on open-ocean hunts or journeys. Not only did the climate disrupt trade, but the market did, too. Around 1400, the value of ivory in Europe fell as tusks from Russian walrus and African elephants flowed into the continent. Even as surviving from marine resources became more difficult, the growing season on land shortened, and the meager pastures yielded even less. But soil and sediment analyses show that the farmers, too, tried to adapt, Simpson said, often fertilizing and watering their pastures more intensively as temperatures dropped. “We went in with the view that they were helpless in the face of climate change and they wrecked the landscape,” Simpson says. Instead, he says, these “pretty good managers” actively adapted to the cooling climate. In the end, however, their best efforts fell short. At the grand bishop’s seat of Gardar, 35 kilometers away by boat from the modest farm at Tasilikulooq, grass grows around the ruins of a cathedral, the bishop’s residence, and myriad other buildings probably built by stonemasons shipped in from Norway. Stone shelters here once housed more than 100 cows—a sign of power in medieval Scandinavia. If the Greenland settlement was originally an effort to find and exploit the prized natural resource of ivory, rather than a collection of independent farmers, the society would have needed more top-down planning than archaeologists had thought, says Christian Koch Madsen of the Danish and Greenlandic National Museums in Copenhagen. His work and other research support that notion by revealing orchestrated changes in the settlement pattern as the climate worsened. Madsen carefully radiocarbon dated organic remains like wood from the ruins of 1308 Norse farms. The dates show that Gardar, like other rich farms, was established early. But they also suggest that when the first hints of the Little Ice Age appeared around 1250, dozens of outlying farms were abandoned, and sometimes reestablished closer to the central manors. The bones in middens help explain why: As temperatures fell, people in the large farms continued to eat beef and other livestock whereas those in smaller farms turned to seal and caribou, as Diamond had suggested. To maintain their diet, Greenland’s powerful had to expand labor-intensive practices like storing winter fodder and sheltering cows. He thinks that larger farms got the additional labor by establishing tenant farms. The stresses mounted as the weather worsened, Madsen suspects. He notes that the average Norse farmer had to balance the spring- and summertime demands of his own farm with annual communal walrus and migratory seal hunts. “It was all happening at once, every year,” Madsen says. Deprivation in lower societal strata “could eventually have cascaded up through the system,” destabilizing large farms dependent on tithes and labor from small ones. The disrupted ivory trade, and perhaps losses at sea, couldn’t have helped. The Greenland Norse simply could not hold on. It adds up to a detailed picture that most archaeologists studying the Norse have embraced. But not everyone agrees with the entire vision. Fitzhugh of NMNH, for one, questions the reconception of the colony as an ivory-focused trading post and still thinks farming was more important. “They couldn’t get enough ivory to maintain 5000 people in the Arctic,” he says. The NABO team hopes future grants will allow them to fill out that picture. They’re eager to start new excavations in the Western Settlement, where artifacts could shed light on any contact between the Norse and Inuit, a historical possibility about which there are little hard data. Time is running out. The Tasilikulooq excavation yielded well-preserved artifacts including wooden spoons, bowls, and a small wooden horse. But McGovern fears that its success may not be repeated. Thirty years ago most sites in the Eastern Settlement contained preserved bone, hair, feathers, and cloth. A NABO survey of 90 sites has found, however, that most organic samples “had pretty much turned to mush” as the permafrost thawed, Smiarowski says. Tasilikulooq was one of only three sites spared. Hans Egede, the missionary, wrote that he went to Greenland 500 years ago to save its people from “eternal oblivion.” Today’s archaeologists fear a different oblivion—that Greenland’s prehistory will be lost unless it is quickly unearthed. As pioneers who weathered climate change, the Greenland Norse may hold lessons for society today. But the very changes that make those lessons urgent could keep them from ever being fully deciphered.